While this may seem like standard CE contents to some, I love stuff like this. People that know me know how I adore art books. Some people may not care about them, but I’ll sit and read them from cover to cover. The soundtrack is standard as well, but it’s only ten tracks. Since the other soundtracks had more music, I was underwhelmed that only ten tracks are going to be on this CD, but then I realized that there aren’t as many new zones in this expansion as there were for others. The in-game pet looks like the Netherwelp with a new skin. Still, I have my copy on pre-order. The book and soundtrack alone are worth it to me, and I can’t wait to watch the DVD. I’m always curious as to how games are put together. What are your thoughts on the Collector’s Edition? Worth it? Leave a comment or post in our forums. I have to admit that I am completely enticed by this collector’s edition. 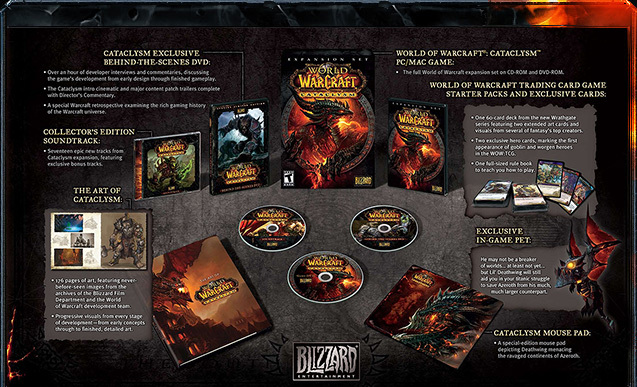 I haven’t played WoW in nearly two years and really am not sure if I will return for Cataclysm. But I may just have to buy this CE either way! I’ll put it on the shelf with my WarHammer CE that I never installed. Thanks for sharing the news. Keep up the great work.